As discussed above, all currently available methods of estimation of GFR have several limitations in the geriatric population. In addition to these limitations, the Baltimore Longitudinal Study on Aging showed that age-related decline in GFR may not always occur. 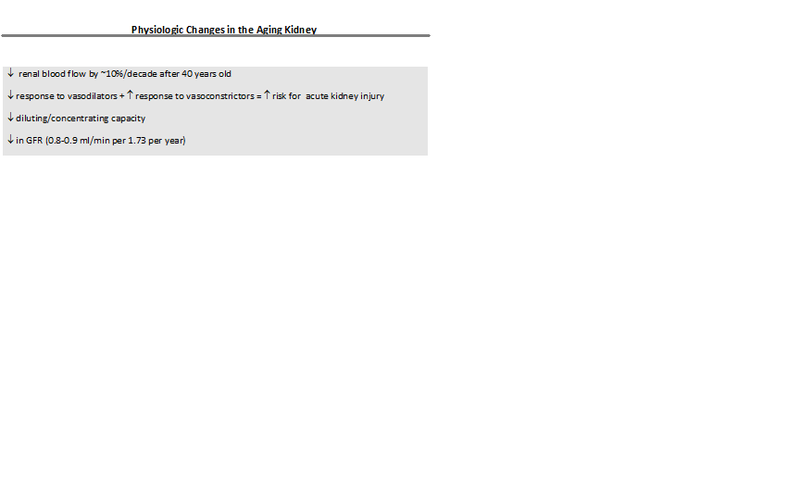 This information can make differentiating age-related decline from chronic kidney disease difficult. The MDRD method is currently the most widely reported laboratory method of GFR estimation in the elderly person1. Serum creatinine and GFR estimation equations can be applied only when creatinine is stable. One geriatric based study showed that the MDRD formula most accurately predicts GFR in the geriatric population(2). The Cockcroft Gault equation provides an estimate of Creatinine clearance. Conclusion: Clinicians cannot use the serum creatinine alone as a measure of renal function in the geriatric patient. No matter what measure is used to estimate the age related physiologic decline in renal function, clinicians must recall that these are estimates. Individual variability exists and patients need clinical monitoring of pharmacotherapy to insure adequate drug dosing and effect, avoidance of toxicities, and optimal patient outcomes. In life threatening situations and for drugs that have significant toxicity, pharmacokinetic profiling with monitoring of drug levels may be needed as an adjunct to estimates of renal function so that precise dosing can occur. Geriatric patient with abnormal creatinine or eGFR. React to clinical laboratory values in a geriatric patient. Currently, GFR is the best index available to assess kidney function in an individual. In a young, healthy adult, normal GFR ranges from 120 to 130 ml/min per 1.73 m2. After age 40, GFR has been shown to decrease by 0.8-0.9 ml/min per 1.73 m2 per year(1). The 24 hour Creatinine clearance can be difficult to collect in any population. With the higher prevalence of cognitive and functional decline, this may be even more difficult among the geriatric patient population. Because of tubular secretion of Creatinine, CCr systematically overestimates GFR and therefore estimation of GFR using the CCr alone has been shown to be unreliable. One novel method for measurement of GFR is the endogenous substance cystatin C. This substance is like creatinine but is constitutively produced by all nucleated cells, freely filtered, reabsorbed, and catabolized by the kidney. Early studies have shown that serum cystatin C levels correlate better with GFR than does serum creatinine alone, especially at higher levels of GFR1. Limited testing availability for cystatin C and lack of larger supporting data make cystatin C a promising lab value for more accurate measurement of GFR in the future. To discuss limitations of Creatinine and GFR lab values in the Geriatric population. To review formulae for estimating Glomerular Filtration Rate (eGFR). Aras, S; Varli, M; Uzun, B; Atli, B; Keven, K; and Turgay, M. Comparison of Different Glomerular Filtration Methods in the Elderly: Which Formula Provides Better Estimates? Renal Failure, 1/24/12 ePub. Earley A, Miskulin D, Lamb EJ, Levey AS and Uhlig K. Estimating equations for glomerular filtration rate in the era of creatinine standardization - a systematic review. Ann Intern Med published online February 6, 2012. Users are free to download and distribute Geriatric Fast Facts for informational, educational, and research purposes only. Citation: Christopher J Anderson, Edmund Duthie MD, Fast Fact #8: Laboratory Evaluation of Kidney Function in Geriatric Patients: February, 2012.